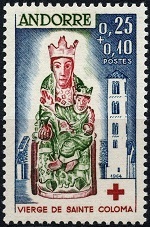 The first commemorative French Andorra stamps appeared in 1962. From this point onward, most of the French stamps of Andorra would now be issued for commemorations or special events. With only one minor exception during this period, the ongoing run of the very long French Andorra pictorial definitive stamps, first begun in 1932, finally came to an end. The one and only French Andorra charity stamp, issued in 1964, is also included at the end of the right column. The 50 C. denomination commemorative stamp shown above (Sc. 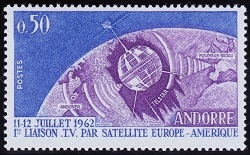 #154) was issued on September 29, 1962 to celebrate the first live television transmission between the US and Europe via the Telstar Satellite. The design features the Telstar Satellite orbiting the Earth. The Telstar Satellite, built by Bell Labs, was launched from Cape Canaveral, Florida on July 10, 1962. It transmitted the first television pictures, telephone calls, and faxes between the US and Europe. Though it was taken out-of-service in February 1963, the satellite continues to orbit the Earth to this day! The 20 C. denomination stamp shown above, at the left (Sc. #155), was issued on June 22, 1963 to publicize La Sardana, a Catalonian dance that is also popular in the Pyrenees Mountains. 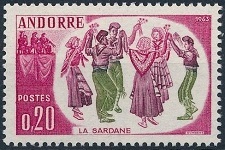 The design features a group of people dancing La Sardana (Fr. "La Sardane"). The 25 C. denomination stamp shown above, at the right (Sc. 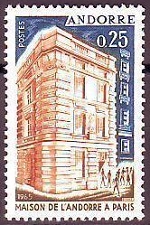 #158), was issued on January 20, 1964 to publicize PHILATEC, the International Philatelic and Postal Techniques Exhibition, held in Paris, France, June 5-21, 1964. The design features the Church of Santa Coloma in the Andorra la Vella Parish and the Champs-Elysées Palace in Paris. The two commemorative French Andorra stamps shown above (Sc. #156-157) were issued on June 22, 1963 to celebrate important events in Andorran history. The 50 C. denomination features Charlemagne (742-814) crossing the Valleys of Andorra during the late 8th Century (c. 778). The 1 Fr. denomination features Louis the Pious (778-840), Charlemagne's son, re-affirming the founding charter (c. 788) to the Andorran people, in reciprocation for their support during Charlemagne's Frankish-Moorish Wars of 779-812. The two commemorative stamps shown above (Sc. #159-160) were issued on April 25, 1964 to celebrate important events in Andorran history. The 60 C. denomination features Napoleon Bonaparte (1769-1821) re-establishing the co-principality in 1806. The 1 F. denomination features the Bishop of Urgel and the Seigneur of Caboet confirming the co-principality in 1288. 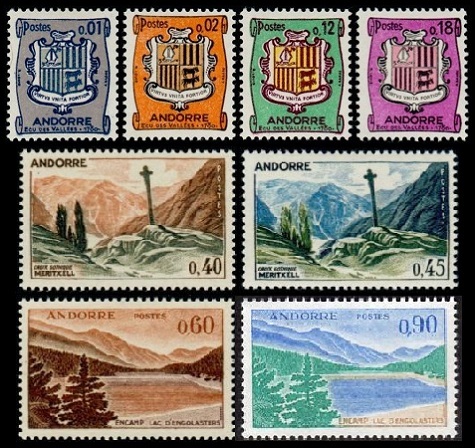 The eight pictorial definitive French Andorra stamp types of 1961 shown above were issued between 1964 and 1971. These new pictorial definitive stamps feature new denominations. 01 C. (1964 - Sc. #161) - Multicolored. 02 C. (1964 - Sc. #162) - Multicolored. 12 C. (1964 - Sc. #163) - Multicolored. 18 C. (1964 - Sc. #164) - Multicolored. 40 C. (1965 - Sc. #165) - Multicolored. 45 C. (1970 - Sc. #165A) - Multicolored. 60 C. (1965 - Sc. #166) - Multicolored. 90 C. (1971 - Sc. #166A) - Multicolored. The two special purpose stamps of French Andorra shown above (Sc. 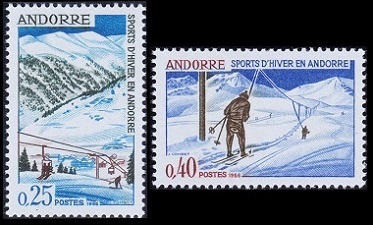 #169-170) were issued on April 2, 1966 to publicize winter sports in Andorra. The 25 C. denomination features a chair lift, and the 40 C. denomination features a ski lift. The 60 C. denomination stamp shown above (Sc. 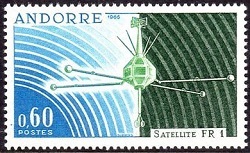 #171) was issued on May 7, 1966 to commemorate the launching of the first French satellite on December 6, 1965. The design features the FR-1 Satellite in Earth orbit. The purpose of the satellite was to study the propagation of low frequency waves in the ionosphere and magnetosphere. The 60 C. denomination stamp shown above (Sc. #167) was issued on May 17, 1965 to commemorate the 100th Anniversary of the International Telecommunications Union. The design features a Syncom Satellite above the Pleumeur-Bodou Tracking Station in Brittany, France. The 25 C. denomination stamp shown above (Sc. #168) was issued on June 5, 1965 to publicize the Andorra House (Embassy) in Paris. 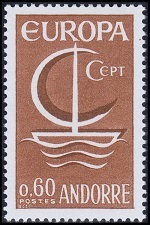 The 60 C. denomination French Andorra EUROPA - CEPT stamp shown above (Sc. #172) was issued on September 24, 1966. Andorra has issued both French and Spanish EUROPA - CEPT stamps since 1966. However, Andorra can not join PostEurop, because its postal system is managed by two different countries, being Spain and France. The 25 C. + 10 C. denomination French Andorra charity stamp shown above (Sc. #B1) was issued on July 25, 1964, with the surtax benefiting the Red Cross. The design features the statue of "Our Lady of Meritxell" in the Church of Santa Coloma.